Last Friday morning Roger Stone was arrested at his house. Rather than follow the usual procedure in a case where the suspect is not a flight risk and is not armed, the FBI stormed his house with heavily armed agents and scary-looking vehicles. The normal procedure in similar cases is to call the suspect’s attorney and have the suspect turn himself in. Evidently the Mueller team is into drama. CNN coincidentally was on the scene to film the episode so that it got played endlessly on the mainstream networks. However, they seemed to have forgotten to play all of the video. Does anyone else find this highly inappropriate? Today The Daily Caller posted an article that includes an amazing quote by Tom Perez, the Chairman of the Democratic National Committee. …“I’ve learned this from the outreach we’ve done at the DNC. Why aren’t we penetrating, I ask? And I had someone in northwest Wisconsin tell me: ‘You know what? For most of the people I know, their principle sources of information are Fox News, the NRA newsletter and the pulpit on Sunday.’ And it should come as a surprise to no-one that our message doesn’t penetrate,” Perez continued. “It should come as a surprise to no-one that that person has elevated the issue of courts to the top because that person on the pulpit is saying ‘ignore everything else that this person has done and is doing, we have to focus on one issue of Roe vs. Wade.’ And people buy it. Because that’s their only source,” Perez asserted. It’s interesting to me that the Democrats love to criticize Fox News. It never occurs to them to criticize the bias of CNN, MSNBC, or any of the major outlets. I think the problem with Fox News (according to liberal thinking) is that it was the first network to present a narrative different from all of the other networks. The lead stories on the news at CNN, MSNBC, CBS, NBC, and ABC are quite likely to be the same. They may not be actually coordinated, but they will be the same. If you want a different perspective, you have to go to Fox News or alternative news sites on the media. It is also interesting to me that a politician would be so bold as to criticize what people hear in church. This should be a wake up call to Americans that their votes matter–if people who think like Tom Perez gain full control of our government, what you hear in church may be severely censored. 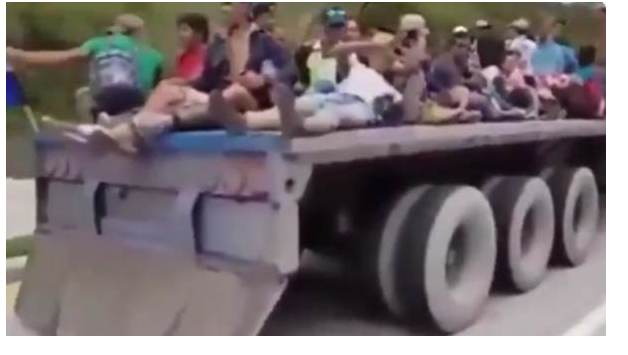 First of all, The Gateway Pundit posted an article today that points out that the migrant caravan is not walking to America–they are arriving on flatbed trucks. That actually makes sense. Who is paying for the trucks and the gasoline? It’s clearly impossible for an individual or a group to cross the southern Mexican border and then walk all the way to the northern Mexican border in a matter of a couple of days. It is simply not possible. Yesterday The Daily Caller posted an article that I believes sums up the problem with the immigrant caravan headed this way. Things got awkward fast after Fox News host Tucker Carlson asked Univision anchor Jorge Ramos to state exactly how many caravan members HE planned to personally take in. Ramos, an outspoken immigration advocate, spoke with Carlson remotely on Tuesday from the caravan in southern Mexico. The Fox News host’s question came after the Univision host made several comments defending its members, including insisting unequivocally that none of them were from the Middle East. “How many of these migrants are you taking in personally into your home and are supporting once they get into the United States?” Carlson asked. “I think that again this has nothing to do with individuals. I wish I could help all of them,” responded Ramos. The problem is that we all want to help them, but we are not able to help all of them without overwhelming ourselves. Those who are saying we need to let in these thousands of people and feed and clothe them need to remember that we have homeless Americans (many of whom are veterans) that we need to help first. I am sorry that they have been misled to make the trip north by empty promises, but notice that the countries that they passed through on their way here have not provided them with asylum (as required by international law). The only way to stop the flow of illegal immigrants into America is to send them home. In looking at the potention damage letting this caravan of people into the country could do, we need to remember the Cloward-Piven Strategy. The Cloward-Piven strategy is a political strategy outlined in 1966 by American sociologists and political activists Richard Cloward and Frances Fox Piven that called for overloading the U.S. public welfare system in order to precipitate a crisis that would lead to a replacement of the welfare system with a national system of “a guaranteed annual income and thus an end to poverty”. That is the promise of communism. We see how well that has worked in the past. Yesterday John Hinderaker at Power Line posted an article about a story that has recently been in the news.The media has been reporting that Siraj Ibn Wahhaj was training children to commit school shootings at a compound in New Mexico. The compound housed eleven hungry children in deplorable conditions. I suspect at least some members of the major media have children in school. Shouldn’t they at least be concerned for the safety of their own children? Keeping Americans in ignorance of the threat of Islamic supremacists does not help keep Americans safe. One of the things that pundits who understand the politicization of the FBI and DOJ during the Obama administration have stated is that the corruption in the upper levels has not spread to the lower levels of the FBI. That is becoming obvious. On Tuesday The Daily Caller posted an article about some recent rumblings within the ranks of the FBI. …These agents prefer to be subpoenaed to becoming an official government whistleblower, since they fear political and professional backlash, the former Trump administration official explained to TheDC. Let’s hope those subpoenas are issued soon. We need to drain the swamp that the FBI and DOJ have become and get on with dealing with our economy and the national security threats that were allowed to develop during the past administrations. Right now most Americans are very concerned about the risk of the Ebola virus in America. The Center for Disease Control (CDC) does not seem to have a consistent message regarding how to prevent the virus from spreading, and meanwhile although caution is being recommended, there have been some mistakes in dealing with the virus that are simply the result of a lack of caution. The Defense Threat Reduction Agency and the federal government’s Models of Infectious Disease Agency co-funded a September 2 analysis on the threat of Ebola’s spread to countries including the United States, Israel’s Arutz Sheva reported. The analysis was circulated among federal government officials prior to its September 2 publication date. The analysis found a nearly 25 percent “probability of Ebola virus disease case importation” to the United States within 3 to 6 weeks. On September 16th, the President stated that according to ‘experts across our government’ the risk of Ebola in America was very low. Either President Obama was unaware of the report, or he was lying. Either way, there is a problem. Hopefully, the Ebola virus in America will be contained, but even if it is, the lives of three people and their families have been impacted in a very negative way because America had been lulled into a false sense of security. Common sense says we should make an effort to stop people from coming into America from places where the virus is active, but so far the President has not been willing to do that. We need to apply some common sense to this problem. For some reason that is not currently happening. Hot Air posted an article today about next year’s health insurance premiums–they will be available after the election. Consumers will be expected to enroll in their insurance plans for the coming year beginning on November 15th. Last year they had the entire summer to register, but then that was not an election year. It’s up to the voters of America at this point. Unless you make your opposition to ObamaCare heard at election time, it will never be repealed. Don’t vote for any Congressman who voted for ObamaCare–he obviously did not have the best interests of America in mind. On Tuesday, the Daily Caller reported that the largest healthcare insurance company (with the lowest premiums) is dropping out of Minnesota’s ObamaCare Exchange because the government health-exchange is unsustainable. PreferredOne Health Insurance told MNsure, the state-run exchange, Tuesday morning that it would not continue to offer its popular insurance plans on the marketplace in 2015. It’s “purely a business decision,” spokesman Steve Peterson told KSTP-TV. The company is losing money on administrative costs for plans offered on the bureaucratic and glitchy government exchange. Part of the problem, according to PreferredOne, is that MNsure hasn’t even been able to verify its customers’ information. PreferredOne said that some of its customers have turned out not to even live in Minnesota. Insurers are required to accept customers who’ve been approved by the exchange for coverage, but states and the federal government have been struggling for months to determine which applicants are actually eligible for the benefits. Americans were told that if they liked their health insurance, they could keep it. Now people in Minnesota have lost their health insurance twice under ObamaCare and are facing large rate increases this fall. Can we please elect people to Congress who will make this monstrosity called ObamaCare go away. Enough is enough. Are They Following Any Rules? Today’s Daily Caller is reporting that because they did not follow their own rules and policies, the Internal Revenue Service (IRS) has put American taxpayers at risk of fraud and identity theft. If one needs further evidence that the Internal Revenue Service (IRS) has veered out of control, look no further than last week’s Treasury Inspector General’s report that found serial failures on the part of the agency to conduct basic background checks on contractors used to handle sensitive taxpayer information. In just one instance, a computer disk with 1.4 million American names, addresses and even Social Security numbers was handled by contractors without background checks, putting taxpayers at unnecessary risk for fraud and identity theft. What makes this even more outlandish is that this is not just a breach of common sense; it is a violation of IRS policy. It seems that the IRS is lax about following their own regulations in a number of areas. Furthermore, other investigations have brought to light accounts of money wasted by the IRS on lavish agency conferences while the rest of the country struggled in a deep financial recession. Spoof training videos were produced by the IRS while other government agencies were furloughing employees. And to top it off, from 2011-2012 alone, more than $1 million in bonuses were paid to IRS employees who were delinquent on their own federal taxes! …The IRS is out of control, and if Commissioner Koskinen wants to return some faith to the agency he leads, he can start by holding his people responsible for the IRS’s outrageous behavior. Will the Obama Administration hold the IRS accountable for its behavior? If not, it is time to consider an alternate tax policy that would abolish the IRS. At an Islamic center, VICE Media captured a group of ISIS fighters holding guns and singing a song with lyrics containing declarative statements that the group had already destroyed America and Europe, perhaps imagining a future they hope to bring about. “We have broken America in two and we’ve annihilated the countries of Europe,” the terrorists sang. This is not a religious war in a distant country–this is a war with America as its eventual target. I have no idea what to do with children who are being taught the kind of hatred that these children are being taught. Islam is not a religion of peace–what these children are being taught has no relationship with peace.